Tonight I decided to add a little burlap touch to some of the frames. In honor of real life, I am crafting in a dark corner of my living room. You see, my children flooded our bathroom upstairs a few nights ago and so we’ve had to turn off the electrical breaker for our ceiling lights in the living room while everything dries. I’d craft upstairs in my guest/craft room, but my grandma is staying with us in that room. And, my hubby is hanging out in the living room and I’m a magnet to where he is hanging out. You already know that not all crafting happens in front of a beautiful, sunlit window. Most of it happens in front of the TV after the kids go to bed. Am I right?! Despite all that, I still really want to share this tutorial with you, because it is simple and easy and I think it makes a huge difference! Can’t think of why I’d want to cover up that pink mat leftover from the previous picture. I mean, it is so “charming”. So, let’s get that pink covered up. I cut a ~3/4 inch buffer around the matting. Next, hot glue the edge around the matting, beginning with the corners. 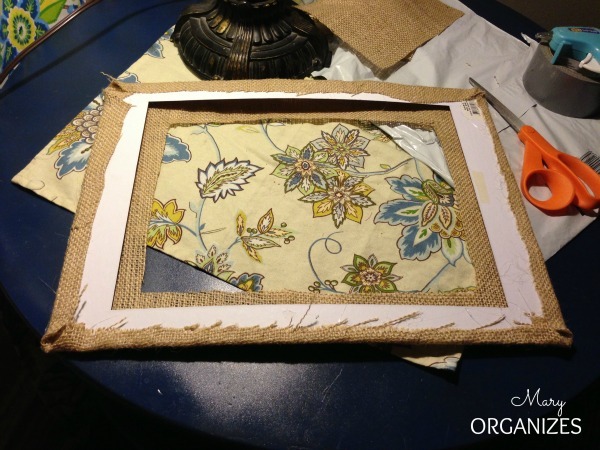 Then, cut out the extra burlap in the middle of the frame, giving approximately the same amount of buffer. Snip a diagonal in each corner pointed toward the corner of the matting. Do NOT cut it all the way to the edge. Use hot glue to secure the burlap to the inner edge of the matting and that’s that. Put the frame back together. The burlap adds interest and texture. Not to mention covers up less than desirable matting colors. This took me less than 10 minutes, even stopping to take pictures for this tutorial! Seriously! I ran out of hot glue sticks on my third frame and tried duct tape. (Well, I had more, but my grandma was sleeping where I keep more upstairs and I didn’t want to wake her up!) I can tell you that hot glue is WAY BETTER than duct tape. Just in case you were wondering. I’ll be showing you my collage wall, as well as bits and pieces, just as soon as I get all the pictures set. One thing I’m excited to share is how I textured, painted, and antiqued the frames in a super easy way. Stay tuned! !